Brief: Our customer, Gerovital, wanted to promote their Expert Treatment haircare line. 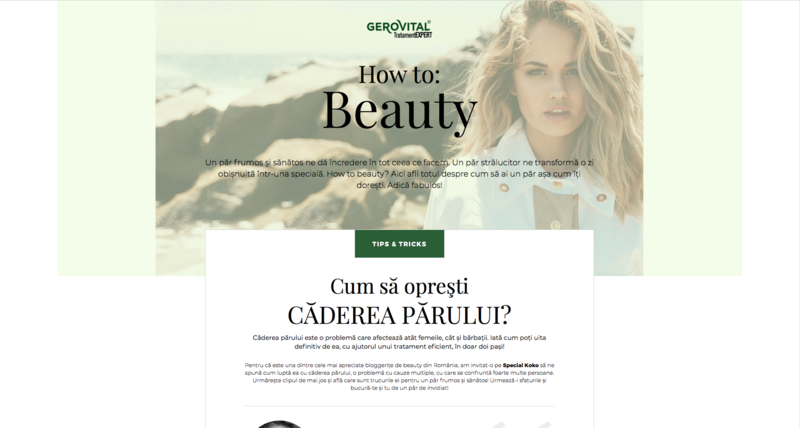 Gerovital already is the #1 skin care brand for Romanians, so their desire was to lend popularity to their special line too. They requested a special project in order to help them achieve their goal. Concept: Take our readers in a virtual tour that will show them how to have the most beautiful hair, using Gerovital products. With special guiding offered by the most popular Romanian beauty bloggers, they find out the best tips and tricks, kept secret until now. Delivrables: Special website (copywriting, design, coding, management), 5 videos (production, concept, copywriting, editing), lead generation.